Much has been written about bicycles. There seem to be as many opinions as there are bicycles. We will not bore you with too many details but will give you a brief description of what we’re riding. Everyone has personal preferences and there is no such thing as the perfect bicycle. That said, we like our current touring bikes. 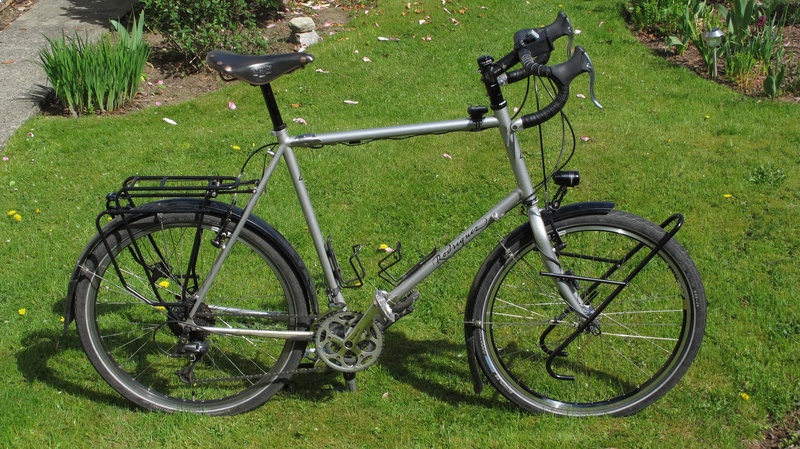 Previously, Paul had a TREK 520, a classic tourer that’s been around for many years and is a solid performer, but it did have some shortcomings. Janice rode a beautiful Allegro with gorgeous chromed lugs for 20 years. Paul’s bicycle with the huge steering tube. The frame is high quality chromoly steel that, should it break (unlikely but you never know), can be fixed by welders everywhere. Try that with aluminum. The UTB has 26-inch wheels instead of 700c, and the frame is built wider to accommodate mountain bike tires up to 2 inches wide along with wide fenders, essential if you go off the beaten track like we often do. 26-inch tires are generally available all over the world. One of our friends shredded a tire when we were in Morocco but in the next town he was able to buy two new tires for about $10. We had Rodriguez put S&S couplings in the frame. S&S coupling in the top tube. 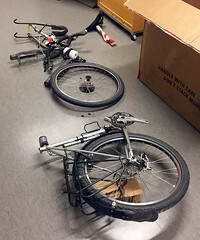 Because of the S&S couplings, the frame pulls apart in two pieces and we can pack the entire bicycle into a 26 x 26 x 10-inch case or bag and check it in as luggage, thereby avoiding airline charges of up to $200 or more per bike, per flying segment. Our couplings were paid for in no time. 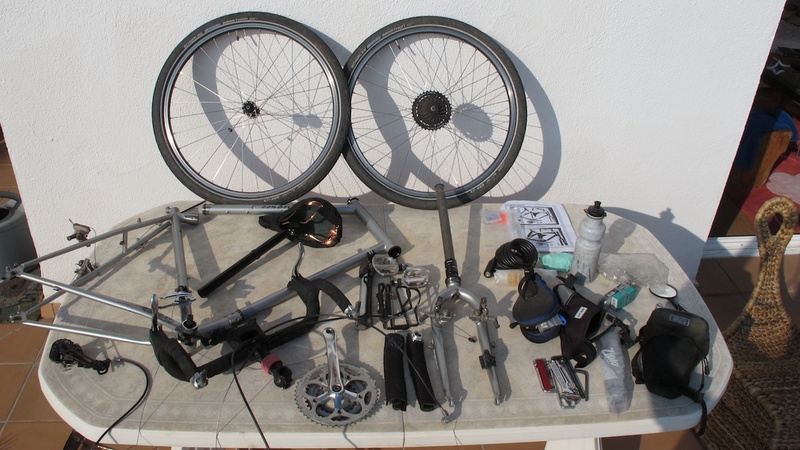 To pack it, the entire bike gets taken apart. Makes you a pretty good bike mechanic. It’s a bit of a puzzle, but the entire bike gets packed into a case or soft-shell bag. The whole process of disassembly and packing takes about an hour to 90 minutes. The same for unpacking and reassembly. This year, we’ve made some modifications to the bicycles. 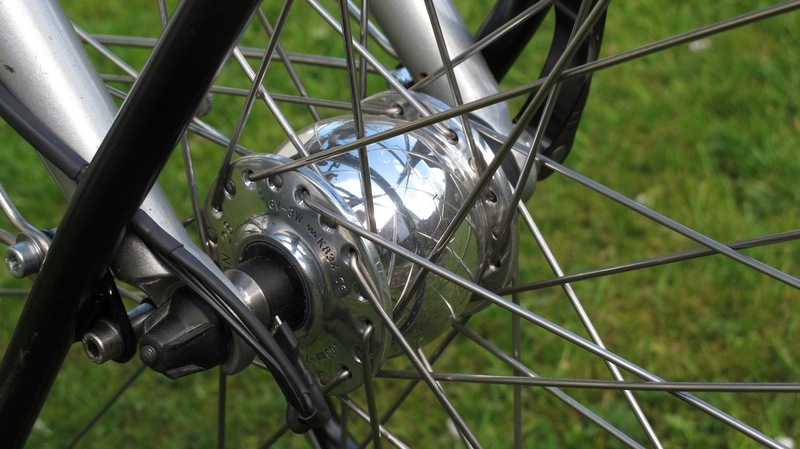 The brakes on the UTB were custom-built Trillium Big Squeeze Tandem Brakes, designed for giving good stopping power to heavier tandem bicycles, or fully loaded touring bikes. Great idea. I like good brakes, especially coming down a mountain at 50+ KM per hour on a fully loaded bike. However, they proved to be a bit finicky to adjust and would go off-centre fairly regularly. So, the Big Squeeze got the Big Heave and we have installed Shimano V-brakes. Easy to adjust and widely available. The downside: the pads wear much faster than the cantilever brake pads. Small price to pay in exchange for ease of maintenance. The other major change on the bicycles are the front wheels. There is nothing wrong with the wheels we have but we wanted the ability to have full-time lights on the bicycles for visibility and safety, as well as the ability to charge batteries. 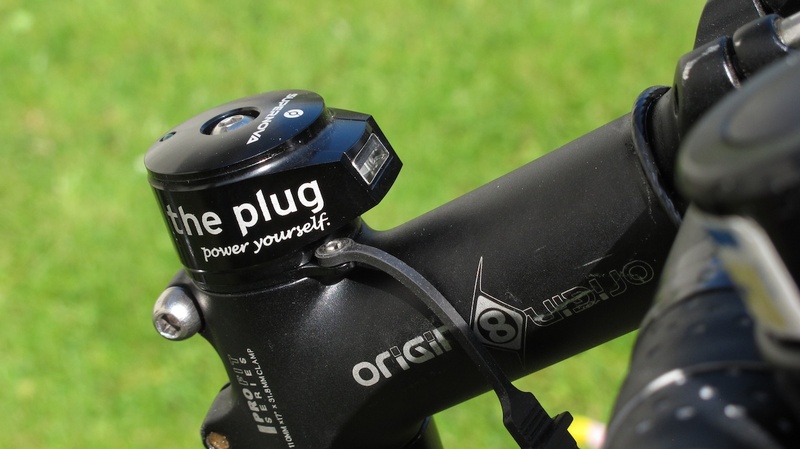 As a cyclist, you’re generating a fair bit of power while you pedal so you might as well convert some of it to electricity which we seem to be using in ever-increasing quantities. The rear wheels remain unchanged with the very rugged Phil Woods hub. Kissing Crows Cyclery, our neighbourhood bike shop on Main Street in Vancouver, built some new wheels for our bicycles, using rugged Mavic rims and Schmidt Dynamo hubs. We installed Supernova E3 Pro headlights and taillights, and on Paul’s bike, The Plug II from Tout Terrain, a USB charger that is integrated with the headset. This little gizmo enables us to charge batteries, our iphone and e-readers. If the technology exists, use it, I say. I purchased a Rodriquez UTB about 5 yrs.ago and have put on about 8000mi. I read about the up grades you made on yours. Were you satisfied with the gear and the handle bar changes? 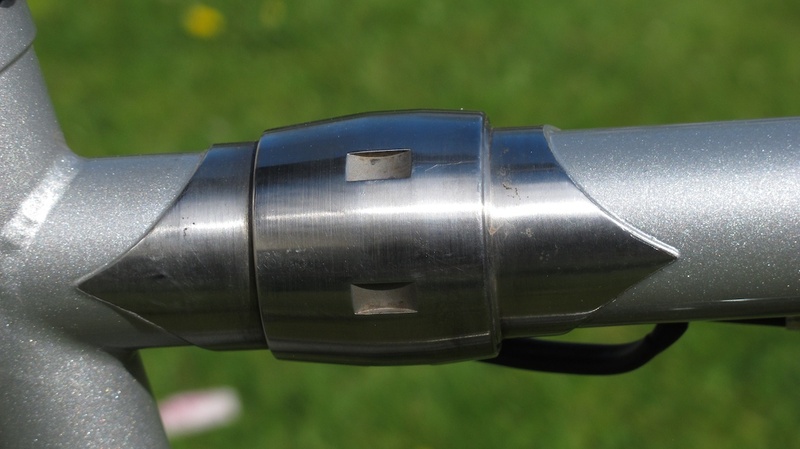 What bike racks were you using and would you make any changes with theses? I decided to sell my business and finely go on my dream trip — Alaska to Chile. My sons live in Vancouver so I will start out from there. Any more advice on the Rodriquez would be appreciated. I enjoyed you blogs and gained a lot of useful info.from them. Thanks so much. When we bought our UTBs the gearing wasn’t really the best for climbing. I think the rings were 28-38-48 which is not nearly good enough for climbing steep hills. So we changed them a year later and changed them again to have better climbing ratios. I really like my setup now with the 9-speed and 22-34-46 coupled with an 11-34 cassette. It gives a great ratio for climbing. I like the Jones bar and will put it on my ECR too. It’s nice to sit up a bit straighter. Less strain on the neck and shoulders. The racks we have are from Tubus. They are light weight steel and can take a lot of abuse. Aluminum would likely not have taken the abuse ours got on some of South America’s rough roads. Enjoy your journey. It’s quite an undertaking. If you’re going to blog about it, please send us the link.